An arts programme worth £1m was launched today targeting an important government priority to tackle the social exclusion of older people. 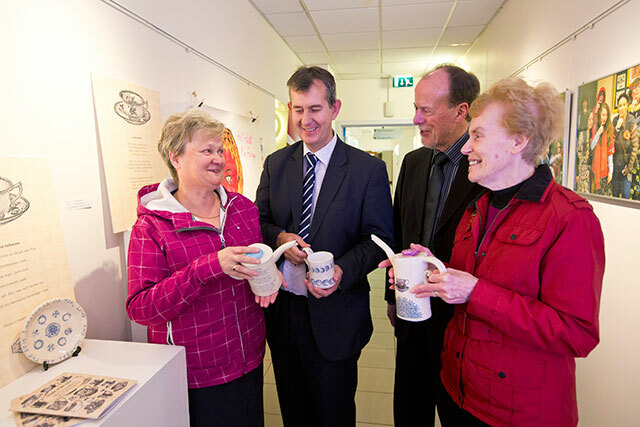 Government Health Minister Edwin Poots MLA, today lent his support to launch the Arts Council and Public Health Agency ’s Arts and Older People’s Programme (Wednesday October 16th ) which uses the arts to tackle the important issues of isolation, loneliness and poverty affecting many older people across Northern Ireland today. A mix of cross-government funding and philanthropic investment has helped provide the framework for a new Arts and Older People’s programme that will run for the next three years. Health Minister Edwin Poots MLA along with Permanent Secretary, Peter May, from the Department of Culture, Arts & Leisure and main funding partners the Arts Council of Northern Ireland, the Public Health Agency and the Baring Foundation attended the event which aims to strengthen the voice of older people through the arts, and will enable organisations to employ artists to work with local groups across Northern Ireland in a creative setting. Minister Poots said: “A key challenge for government, business and public and private sectors is how to enable and support older people to get more out of life for longer. This will have benefits for both individuals and society. “Taking enjoyment from all facets of life is key to positive health and well being at any age. I welcome this initiative which demonstrates how government departments and agencies work in synergy and as a result make health improvement a realistic achievement for everyone in our community regardless of age. Today’s launch follows learning from two pioneering pilot programmes. Firstly an Arts Council, Big Lottery programme for Arts and Older People which ran from 2010-2013. It funded more than 50 projects across Northern Ireland, involving some 4,100 participants building projects and activities that engaged with almost 16,000 including a week-long Celebration of Age event. The second project undertaken by the Public Health Agency together with Arts Care Northern Ireland delivered over 350 workshops on a wide range of arts and health activities to some 4000 older people in health and social care settings. The project was aimed at creating positive, creative opportunities in which older people could meet with others, improve their mental wellbeing and reduce the risks of isolation and loneliness. This new project will draw together the learning from both of these initiatives. It will offer a new Arts & Older People Programme (2013-2016) that will deliver more projects with an increase in scale, aiming to support over 70-80 community-based projects across Northern Ireland with grants between £10,000 - £30,000. There will also be a focus on providing training for artists and health staff to increase their skills in essential areas such as working with people with dementia. The programme will link up with similar initiatives internationally with the aim of sharing best practise programmes. It will also offer a targeted project aimed at engaging with older people who may be more vulnerable due to illness, disability or changing circumstances. Arts Care NI will deliver a rolling programme of Arts and Health activities in settings such as community centres, day centres, sheltered housing and residential care. These activities will culminate in and annual Festival of Ageing in each of the five health and social care trust areas. Welcoming the project, Eddie Rooney, Chief Executive of the PHA, said: “We live in a society which has witnessed great change in terms of technology, standards of living and expectation; and with an increasing aging population we need to look to innovation to come to terms with the growing needs of older people. The programme hopes to attract artists along with community and voluntary groups and local authorities who wish to engage in this important programme for access to the arts for older people in their communities. The Arts & Older People Programme (2013-2016) is now open for applications.